Extensive data base of trained, competent work personnel (IR and site based). Latest technology information and communication techniques (on and off-site). Detailed management strategies to complete projects. Up to date Health Safety & Environmental Management Plans. Work Quality Management and traceability systems. Structural steel fabrication and erection. Previous post project reviews highlighted the need to minimise site establishment time and cost. 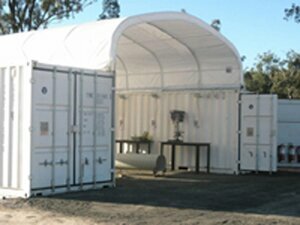 IES has invested heavily in this process which has resulted in customised, self-sufficient workshop containers. Six containers with all weather protection. AC/DC electrical power and lighting. Side access doors with internal-external Davit crane to facilitate bench work. 500Amp diesel welding machines c/w single phase inverters and wire feeders. Extensive range of lifting and slinging equipment. An extensive equipment and tooling inventory has been accumulated based on post project reviews over the entire life of the company. A fleet of site vehicles which are maintained and upgraded on a regular basis.